Student accommodation On-campus housing for traditional age female students enrolled in the Brenau University Women’s College. No housing available for Evening and Weekend College or Online College students. The Associate of Arts in Liberal Studies is a 2-year degree program that provides a platform from which students can continue their undergraduate education. This program provides a more immediate goal for adults who have had little or no college experience. The curriculum mirrors the first two years of Brenau’s baccalaureate degree – yet there are unique courses to help returning or first-time adult students embarking on a college career, such as research and library methods and a course in skills for professional transition. Brenau's RN to B.S.N. bridge program provides registered nurses the opportunity for career advancement by earning a bachelor's degree. An experienced and academically qualified faculty of registered nurses offers this 120-hour program. The clinical portion of this program may be completed in the student's local community, supervised by an approved preceptor. The Bachelor of Business Administration degree program in Management is designed for the generalist who wants a broad business background. Graduates develop skills required to manage all types of business, directing accounting, data processing, inspection, maintenance, marketing, personnel, research, and sales. In addition to general education courses, all candidates must complete a 60 hour major requirements curriculum that includes a capstone course. The Bachelor of Arts or Bachelor of Science in Criminal Justice graduate gains an overview of the American legal system and basic investigative principles. Students develop management skills in law enforcement, human services, corrections, and public service organizations. In addition to general education courses, all criminal justice degree candidates will complete 54 hours of criminal justice and public administration courses. B.A. degree seeking students will learn a foreign language as part of their program, while those students seeking a B.S. will take two additional math or science courses. The Masters of Business Administration program prepares students for leadership positions within any organization. All MBA degree candidates complete a 10-course MBA curriculum that includes a capstone strategy course. Complete this online MBA degree program in less than two years by following one of the four course rotation tracks on the MBA Rotation schedules in the 36 hour Accounting, the 39 hour Advanced Management Studies, or the 33 hour Healthcare Management. MBA graduates develop skills in effective team participation, persuasive leadership, and conflict management while learning the value of the team approach to problem solving. Master of Education degrees are available for certified teachers. Early childhood teachers typically instruct in a variety of disciplines each day. This NCATE approved teacher education masters program offers courses in reading, language arts literature, social studies, science, math, technology, child development and multiculturalism. Self-expression and creativity are encouraged as a part of the learning process. The specialized knowledge reflected in Brenau’s graduate courses in early childhood takes into account immediate experiences for the developing child as well as long-term learning. Program requirements include 34 semester hours divided into six components (see program information below). The program’s capstone activity is either a comprehensive exam or an applied research project. The degree program in middle grades for certified teachers builds upon an undergraduate foundation and focuses on enhanced pedagogy and content knowledge. This NCATE approved teacher education program closely examines the characteristics of middle school organization: team teaching, flexible scheduling, and interdisciplinary programs. Program requirements include 34 semester hours are divided into the following components: a professional core, two content concentration areas, a research course, a reading course, and electives. The program’s capstone activity is either a comprehensive exam or an applied research project. Brenau's goal is to be a leader in the development and provision of quality online programs using the latest distance learning technology. The university’s online programs, first offered in 1998, were developed to serve a constituency of students with life constraints preventing them from attending campus-based classes. Degree programs provide maximum flexibility without compromising learning outcomes or academic rigor. Online classes are delivered via the Internet using the popular Blackboard © course management system. Other common software programs are also used to enhance the delivery of course materials. Dialogue among students, using an asynchronous bulletin board system, is central to the collaborative process. Online students bring with them varied life and work experiences that, when shared in the virtual classroom, provide relevant applications of theory to real world situations. 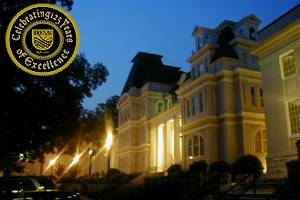 Brenau University, founded in 1878, is a historic, private, comprehensive university in Gainesville, Georgia, celebrating 128 years of excellence in education. The University's three colleges, the Online College, the coeducational Evening and Weekend College (EWC), and the Women's College, have unique yet complementary missions. The Online College serves a population of students who are unable or unwilling to attend campus-based classes. Degree and certificate programs are offered entirely online, with a focus on collaborative learning. The EWC serves a growing population of working adult men and women by offering degree and certificate programs and classes in five locations across the state (Atlanta, Augusta, Gainesville, Kings Bay, and Waleska) and online. The Women's College, located on the picturesque main campus in Gainesville, has provided a single-gender liberal arts education since 1878. Brenau University, accredited by the Southern Association of Colleges and Schools, offers fully online programs with no residency requirement in business, education, nursing, and the humanities. Professors who are trained and certified in online course delivery teach online classes. Those teaching in graduate programs have doctorates in their fields coupled with corporate and/or practical experience. In addition to online application, advising, and registration, other student services are available including career services (job search and career selection), mental health counseling, and disability support services through the campus Learning Center. The Brenau Trustee Library catalogue is available online using the popular Voyager software. Supplemental materials are offered via document delivery and interlibrary loan. Brenau University may accept up to 6 semester hours of transfer credit from other regionally accredited institutions as part of a planned graduate program of study upon approval of the respective department chair. Alternative credit options toward a Brenau University degree (credit earned from advanced placement exams, international baccalaureate programs, CLEP, military credit, experiential credit, or challenge exams) are limited to a total of 27 semester hours.